Designers typically reserve their gob-smacking looks for end of their show, but Matty Bovan came out swinging. 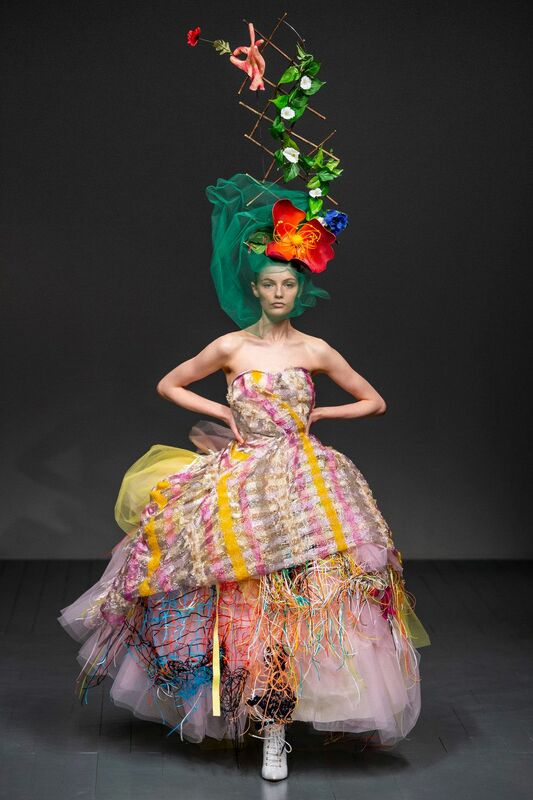 The 26-year-old began his spring 2019 show with sweetheart neckline, cupcake gowns made of frothy tulle, colorful winding wire, and bright frayed fabrics. Topped with elaborate Stephen Jones head pieces complete with flowers climbing up a trellis, kitchen utensils, and dollar bills Bovan's wild opening looks packed quite the punch. Spaghetti strap bikini tops in emerald green, blush pink, and yellow were recast as belts by Katie Grand, the editor and stylist who works on Bovan's shows. They sit inverted at the waist, as if they've come undone at the neck and flipped over. Fanny packs from mini and medium to torso-sized iterations, made in collaboration with Coach, were sprinkled throughout the collection. Emblazoned with the brand's monogram, the bags were painted and punctuated by bright yellow, red, and green. The Central Saint Martins alum's latest collaboration with Coach is available now on MatchesFashion.com. Bovan's waist packs weren't the only place Coach's monogram popped up. Model Finn Buchanan's hair was cut and colored to look like a collage of the brand's "C" motif.